FRIEDRICHSHAFEN, Germany and UTRECHT, Netherlands, March 19, 2019; ZF Friedrichshafen AG has acquired a 60 percent share of 2getthere B.V. The company offers complete automated transport systems and is located in Utrecht/Netherlands, with offices in San Francisco, Dubai and Singapore. Applications range from driverless electric transport systems at airports, business and theme parks to dedicated urban transport infrastructures. With this strategic investment, ZF is executing its Next Generation Mobility strategy to strengthen its foothold in the Mobility-as-a-Service and automated guided vehicle growth markets, complementing its existing activities. "2getthere has more than three decades of experience in the market of autonomous passenger transport vehicles as well as unique engineering and software competences. This acquisition supports our strategy to become a leading autonomous transportation systems supplier in the booming new mobility market", said Wolf-Henning Scheider, Chairman of the Board of Management at ZF Friedrichshafen AG. With this strategic investment, ZF is strengthening its position in the growth markets of Mobility-as-a-Service solutions, autonomous transport systems, and shared autonomous vehicles. The majority stake in 2getthere complements ZF's existing investments and co-operations, such as the e.GO Moove, a joint venture with e.GO Mobile AG, which targets the production of the e.GO Mover autonomous minibus, as well as Transdev, a leading operator and global provider of integrated mobility solutions. 2getthere was founded in 1984 and has accumulated more than 100 million kilometers of autonomous mileage with driverless passenger and cargo transport systems in several major cities worldwide, including Rotterdam, Abu Dhabi and Singapore, as well as numerous ports and airports. 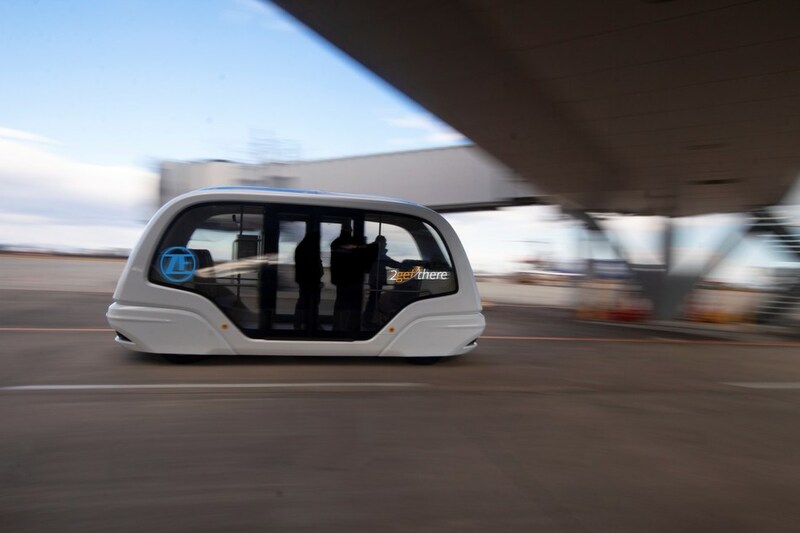 2getthere' s fully electric driverless systems at business parks in Rivium (Capelle aan den IJssel) and Masdar City (Abu Dhabi) have transported more than 14 million people reliably and safely. The reliability of the systems installed by 2getthere, including vehicle controls and software architecture, exceeds 99.7 percent. "The market for driverless electric transport systems is developing dynamically. We want to continue to lead the market and the involvement of ZF is helping us to realize our growth plans, accelerate our technology roadmap and provide the required security for new and existing customers," said Carel C. van Helsdingen, founder and CEO of 2getthere. "The technological cooperation with ZF will support 2getthere's work for the delivery of mixed traffic applications like Rivium and Brussels Airport." Looking at the past three years alone, the company's revenue has increased by 60 percent. In the future, ZF and 2getthere will work closely together to further develop technologies for autonomous transport systems. "We have developed into a complete systems supplier for automated functions and we are therefore in an ideal position to support 2getthere. We can deliver electric drivelines, solutions for sensor technology, high performance computing, and actuators for all levels of automated applications," explained Scheider. Conversely, ZF will also benefit from the vast field experience of the Dutch company and its extensive engineering and software competences when it comes to configuring and implementing complete autonomous transport systems. 2getthere's engineering and software development teams in Utrecht are expected to grow significantly over the next years, approximately doubling its current 60 employees. ZF is a global leader in driveline and chassis technology as well as active and passive safety technology. The company has a global workforce of 146,000 with approximately 230 locations in some 40 countries. In 2017, ZF achieved sales of €36.4 billion. ZF is one of the largest automotive suppliers worldwide. ZF allows vehicles to see, think and act. The company invests more than six percent of its sales in research and development annually – in particular for the development of efficient and electric drivelines and also in striving for a world without accidents. With its broad portfolio, ZF is advancing mobility and services in the automobile, truck and industrial technology sectors. 2getthere delivers driverless transit applications, in mixed traffic, on dedicated lanes or segregated infrastructures. The systems are based on over 30 years of experience with automated vehicles in different demanding environments. Our vision is to continually develop the landscape of automated transit technology by maintaining our entrepreneurial spirit. 2getthere has been at the forefront of introducing new transit systems since 1984. We will continue to push and innovate, providing efficient, high-quality transit systems for point-to-point connections, corridors and networks.